Home » Education » Is the Elliptical Good for Weight Loss? Is the Elliptical Good for Weight Loss? If you’re fed up with the constant pounding of road and treadmill running, or bored with the monotony of those long and arduous bike rides, then the elliptical trainer might just be for you! Is the elliptical good for losing weight? An excellent alternative to the stock cardio machines in your local gym, great for burning those extra calories and melting away that stubborn fat, the elliptical also reduces some of the stress on your joints associated with more common weight-bearing activities. 4 Why Use The Elliptical Trainer? There are numerous factors which contribute to an individual’s weight loss. Exercise and nutrition are probably the two most notable influencers, and when combined effectively, sustainable weight loss is achievable for anyone. Eat more calories than you burn through the day to day activity and exercise and you will gain weight through a calorie surplus. Achieve the opposite and you will have yourself what is known as a calorie deficit and you will lose weight. The more significant the discrepancy between the 2 aspects of the equation to the left of the equals sign, the more exaggerated your weight change will be. There is a range of different ways you can choose to be active in order to help you shed those excess pounds. Many people opt for steady-state cardiovascular based exercise in order to help them trim down, with millions hitting the roads, treadmills, and spin bikes every day in search of their desired bodies. There is no doubt that this form of activity can be pretty effective when it comes to managing your weight. Typically operating at around 50-60% of your maximum heart rate means that you can sustain the exercise for an appropriate duration (30 minutes plus) and it also ensures that the main energy source will be fat. Long periods engaging in exercises like running, rowing and even cycling (to a certain extent), can have their drawbacks though. Running, for instance, places a huge amount of stress on your joints (ankles, knees, hips, and back) and if you overdo it, you can become susceptible to picking up chronic injuries which may prevent you from maintaining your exercise routine. This is where the elliptical trainer (or cross trainer) comes into play. Because your feet never leave the pedals, the level of stress your joints are exposed to is significantly reduced. The fact it remains a weight-bearing exercise, unlike cycling, for instance, means it can also be an effective way of preventing the development of bone issues such as osteoporosis. So we’ve established that the elliptical trainer is an excellent alternative to other more traditional forms of steady state exercise which have tended to be used in order to influence weight. But how should you be using the machine in order to optimize your weight loss strategy? Whilst long duration steady state activity has long been considered the most effective way of exercising in order to support weight loss, more recent research has indicated that shorter bouts of more intense work interspersed with periods of rest or low-level activity may be a more efficient way of burning calories and generating the all-important energy deficit required for weight loss. This method of training, commonly referred to as HIIT (High-Intensity Interval Training) requires you to work pretty much as hard as you can during the periods of activity as you seek to push your heart rate towards 80-90% of its maximum. Whilst exercising at such a heart rate threshold will tend to use a higher percentage of carbohydrates than fat as an energy source, the total number of calories you burn will be significantly higher for the same duration of a session and thus the gross number of fat calories burned will actually be higher. 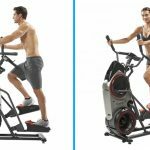 Why Use The Elliptical Trainer? Most research suggests that the calories an individual can burn during an elliptical session are very similar to those used when completing a session of the same intensity on a treadmill, with perhaps the running based activity coming out on top slightly. However, an increasingly popular elliptical machine, the Bowflex Max Trainer M3, is reported to burn calories up to 2.5 times faster than a standard treadmill. However, outside of sheer energy output, the elliptical has a few advantages over the treadmill which could make it a better weight loss option for you. Not only does it reduce the impact on your ankles, knees, hips and lower back as already discussed, but it also enables you to train your upper and lower body simultaneously. By making your workout full body, you are working more muscles and therefore burning more calories… Yay! Not only that, research has shown that those who use an elliptical rather than a treadmill as part of their exercise routine are actually working harder than they perceive, underestimating actual output based on their heart rate. Consequently, you might actually be able to burn more calories on an elliptical than a treadmill with less ‘perceived effort’. Every little helps eh?! Don’t forget, the more calories you can burn, the more likely you are to generate that all important energy deficit required for weight loss. Warm Up – 5 minutes steady state in order to prepare your muscles and elevate your heart rate sufficiently to engage in maximal efforts. Use this time to explore what your maximum effort looks and feels like and what resistance you require in order to achieve it. In order to find the right kind of intensity during your 1 minute periods of work your legs are probably going to be moving too fast to make holding onto the moving handles a viable option. Your best bet is to grip the fixed central handles. If you don’t feel the kind of burn you want to in your legs, try sinking your hips towards the ground slightly so that you are in a partial squat. This should really help to increase the load. The periods of low-level activity are your rest so you will want to significantly reduce the resistance to allow your legs to keep moving with limited to no effort. Stopping your legs moving completely is not a good idea as this will just cause the lactic acid to pool your muscles and increase fatigue. The elliptical trainer can be a really helpful tool for losing weight. 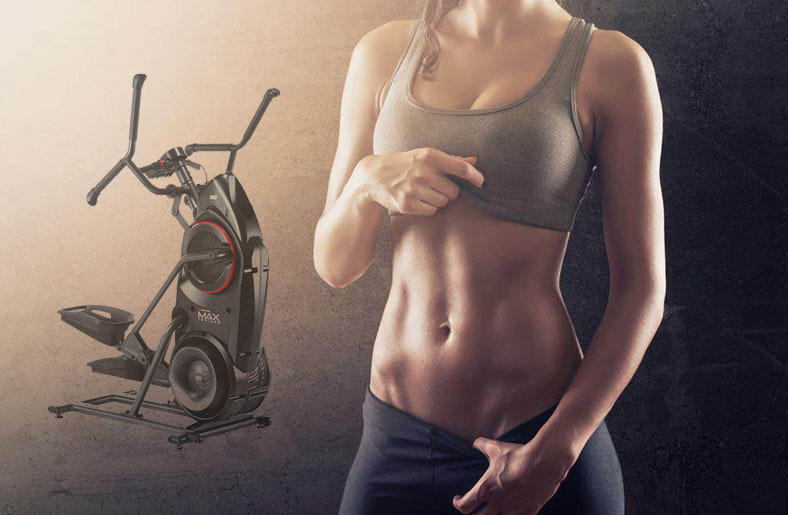 If you want to achieve a leaner and more healthy body shape at the same time as protecting your joints, then maybe you should give the best elliptical trainer a go. Start your sustainable weight loss journey today! A nine-year career as an international field hockey player culminating in representing Team GB at the London and Rio Olympic Games. I have a passion for food, sport, and travel as well as good knowledge of nutrition and physical training methods. Bowflex Max Trainer M5(Now M6) Review For 2019 – Should You Buy It? 2019 Lafitness.reviews Design. All rights reserved.